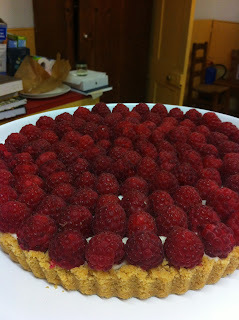 Aga Girls: Fruit tart with lemon and marscarpone. I have promised various people that I would post this recipe. It is what I call a store cupboard pudding. It can be whipped up in ten minutes flat with very little thought, is super easy and looks so impressive. The only really important thing is to make sure that the lemon biscuits that you use are good quality otherwise it can end up being slightly bland. Pulverise the biscuits and add to the butter, place the mixture into the bottom if the tart tin. Cook for about tin minutes at 120C to firm up the base. In another bowl mix the marscarpone, icing sugar, zest and lemon juice. Spread this on top on the biscuit base and decorate with any soft fruit of your choice.